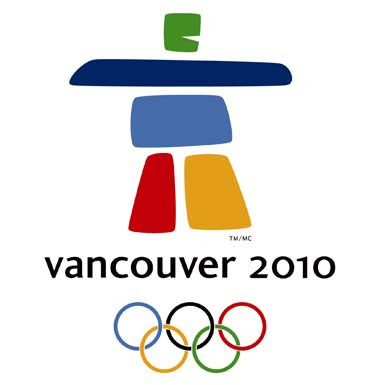 ellehermansen: Vancouver 2010 Winter Olympics! Today is the official start of the winter Olympics in Canada, and I must say I am a little bummed that I am not there right now! But, I got to catch a little bit of the Ski Jump qualifying earlier today (even before the Games had properly started) - and that always gets me proper dizzy watching it. It was fun and comforting though. 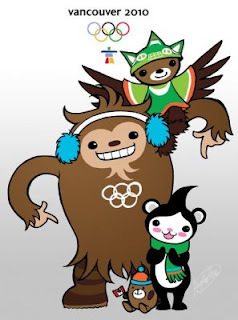 I wish I was actually in Vancouver so I could buy up some MukMuk, Miga, Quatchi, and Sumi merchandise! Right now, I am happy with the travelling tag that I forgot to use on the way home from Canada this last time! Oh well, I can use MukMuk the Vancouver Marmot to take me home safely in March. I took a picture of my travel buddy while on cardboard moving boxes (yes, it's getting close to send this stuff on the boat!). I am happy with the multiculturalism of Canada, but I also love how they kept with the native roots with all of the art and promotions. I love it!